FOR a while, it's just another day as you plod slowly along a downtown street. Maybe your mind is burdened with routine, everyday cares. Or perhaps you are disturbed vaguely by the headline on the newsstand about a new scandal in government. Then, a siren wails and the blare of band music and a weird symphony of automobile horns blend in a wild, unrestrained jumble of sound that echoes up from the canyon that is Fourth Avenue. FACES along Welcome Lane belong to Jack Gordon, left, chair­man of Greater Seattle's Korea Veterans Reception Committee, and Harry Reed, president of the Musicians Association here. Both have been workhorses in the Welcome Lane program. You turn the corner and glimpse a caravan of Army busses [sic] rolling slowly north. A young soldier, home from his country's newest war, is grinning broadly from one of the passing ve­hicles. His eye meets yours and he waves; you lift your hand almost automatically to return his gesture. BY now, the crescendo of sound is rising. Some confetti is falling from the windows of the tall office buildings and you self-consciously brush it from your hair. Then, suddenly, you don't care whether the stuff is in your hair or not. You are standing, now, in Welcome Lane and you find yourself responding to the hoarse exhortations of a young man standing on the back of a flatbed truck, next to the band. He beseeches you, and those standing with you, to cheer these fighting men and your voice joins willingly with those around you. You see girls . . . women, some pretty, some . . . flowers into the outstretched ... of the G.I. 's, and you see . . . standing at the corner . . . battered brown hat raised in salute, and you see a woman burdened with her packages, her care-worn face exhibiting just the trace of a smile, and you feel—just for a moment—the sting of tears in your eyes. Then, the G.I. 's are gone, and it's only the same, old Fourth Avenue. The cold wind gathers up the tangled coils of faded orange, yellow and green serpentine and rolls them along the cluttered curb like tumbleweed on a prairie. YOU face into that wind, squinting against the thin, gold shafts of spring sunlight, and you square your shoulders a little bit. A vague emotion of pride that is linked in some way to all the things you've thought and heard about your American heritage settles within you. And, as you resume your walk, somehow it has become a better day. What is Welcome Lane, and how did it get that way? It has been the subject of much discussion since the first one was opened a year ago tomorrow to mark the start of the Korea veterans' rotation program. Probably its most unusual aspect is that constant repetition fails to abate the enthusiasm with which Seattle has taken Welcome Lane to its heart. But in spite of the city's warm response, Welcome Lane could not function without its core of hard workers who have made it what it is today. THE troop welcomes are sponsored by Greater Seattle, Inc., in co-operation with the King County U.S.O. Commit­tee, the latter headed by L. A. (Bill) Williams. Guy Williams, a former Greater Seattle official, gives much credit to Jack Gordon, the Greater Seattle Korea Veterans Reception Com­mittee chairman, for helping build the festive spirit that surrounds each Wel­come Lane. "Jack's a great cheer leader," Williams explains with a grin. "When he gets up there on the stand and starts shouting over the microphone, sometimes it sounds like there's a lot more people in the street than there actually are." The public-address system that carries Gordon's voice over the "Lane" is operated by Chet Gibson of the Gibson Sound Co. Greater Seattle offered to pay Gibson for his services, but Gibson won't take any money. He figures he's heavily in debt to the heroes of Korea's battlefields, and his sound truck is one way of paying it off. Many of the mornings when troops come home are wet and chill, but there always is a group of musicians on hand to play sprightly tunes, even though their fingers and lips be stiff and cold. They are members of the Musicians Association, Local 76, A. F. of M., and their president, Harry Reed, is the man who obtained the funds to insure their appearance. REED conviced the trustees of the Music Performance Trust Fund (derived from recording royalties) in Chicago that he should have the au­thority to assign groups to play for troop welcomes, without having to clear the red tape in the Chicago office. The Seattle musicians haven't missed a ship yet. Knotty traffic problems that result from bringing a caravan of busses [sic] through the city's busiest streets are unraveled by Capt. 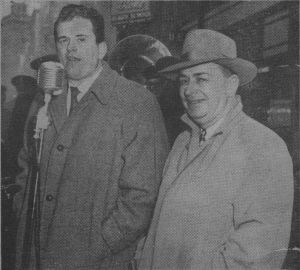 Ralph Zottman and Sergt. E. S. Baker of the Police De­partment and their motorcycle patrol­men. Joe Wasser, civilian motor officer at Fort Lawton, always has a flatbed truck, which serves as the band and reviewing stand, promptly in place each day that troops are coming in. Flowers for homecoming G.I. 's who will ride through Welcome Lane are unpacked by Mrs. Gudrun Baker, Seattle bank employee, who initiated the flower-distribution idea. Seattle wholesale florists donate the blooms for Korea war veterans. Affable Al Rochester, city councilman designated by Greater Seattle as the city's own Grover Whalen, rarely misses a troop homecoming. Fire Chief William Fitzgerald also is a welcoming-committee member. He sees to it that fireboats are in the bay to greet the incoming ships. Although they perform on the pier, before the G.I. 's arrive on Welcome Lane, the dancing Barclay girls have helped bring Seattle international rec­ognition and give the welcomes added zest. Their services also are donated, thanks to Mr. and Mrs. George Barclay of the Barclay Studios. 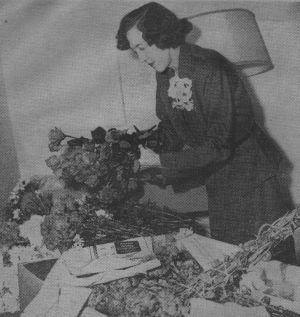 ON the day of the first Welcome Lane, Mrs. Gudrun Baker snatched some flowers from her desk in the Seattle Trust & Savings Bank and dashed into the street, thrusting the blooms into the hands of the veterans. The G.I. 's seemed to like the idea. During subsequent welcomes, other bank women brought flowers from their gardens and the number of women and girls taking part grew in number. Soon other banks and finan­cial institutions were in on the project and flower supply became a major problem. Mrs. Baker paid prompt heed to a suggestion by the late Nat Lund, a Times reporter who covered many Wel­come Lanes, and solicited aid from wholesale florists. The response was prompt and generous. Flowers now are supplied for virtually every wel­come by the Beall Greenhouse Co., George Huserick Wholesale Florists, David L. Jones Wholesale Floral Co. and the Seattle Flower Growers. Collection and delivery of the flow­ers was handled by Sam Fosnaugh and Charles Ducklow of the Seattle Trust & Savings. Later, Mike Oimmings, a Farwest Taxicab driver whose son is a Korea veteran, volunteered to help on the flower pick-ups. Cummings lives five miles outside the city, but he never fails to meet Mrs. Baker early in the morning to deliver Welcome Lane flowers. THE Seattle-First National, Puget Sound Mutual Savings and Peoples National Banks are among the institu­tions that allow their employes to par­ticipate in the flower distribution. Bank of California girls have passed out apples to the veterans on occasion and National Bank of Commerce and Seattle-First National and Washington Mutual Savings Banks employes have thrown candy kisses to the G.I's. Employes of many offices and stores have left their jobs, with or without their boss's blessing, to cheer the men as they pass by. Serpentine—more than 35,000 miles of it has been used so far—is distributed by the Greater Seattle staff and volunteers just prior to each reception in Welcome Lane. Greater Seattle has purchased serpentine at a cost, so far, of more than $3,600. The city has become one of the largest serpentine customers in the nation. PROOF that Welcome Lane has made a lasting impression on the troops themselves comes in letters from the G.I. 's and their families, written once they are home. "Some times," a soldier's mother wrote, "the boys get the idea that no one cares about them fighting for us. But certainly Seattle shows it cares." "I had thought that the first groups to be sent home from Korea would get a heroes' welcome," wrote a former 7th Division man, "but I never dreamed the celebrations would be continued." "The people lined the streets, even though it was raining. The people—­the music—the flowers—it was a welcome home that none of us shall ever forget."